Drum corps fans that can't make it to San Antonio this Saturday for the DCI Southwestern Championship at the Alamodome are in luck. A live Fan Network Webcast from San Antonio, sponsored by Gary P. Gilroy Publications, will give fans access to more than 20 World Class performances right on their home computers. Check out the hot competition as powerhouse corps from all over the country meet up for the very first time in one location on the DCI Tour. Fan Network subscribers logging on will have more options than ever for this exclusive Webcast. Drum Corps International and Tom Blair, Inc., the production company for all DCI broadcasts, are hard at work to make this season's productions better than ever. For the first time, fans will have the opportunity to choose between three different viewing options. 1. Multi-camera with stereo audio – Watch the performances with a variety of camera angles that follow the action from both up close down on the field and from up high. 2. High camera with stereo audio – Watch the performances as if you were a judge sitting in the press box. This vantage point will give you a birds-eye view to see it all! 3. High camera video with designer commentary – Watch the show from the high camera angle and hear exclusive explanations from corps insiders with longtime DCI broadcaster Steve Rondinaro acting as host. As each corps takes the field, one or two of the group's staff members will explain the concept and overall intent of the corps' program, then narrate what to look for during the performance. "Because the shows are so layered and so intricate, watching performances after hearing the concepts explained helps everyone enjoy the shows so much more," says producer and director Tom Blair, who this year will celebrate his 25th year working on Drum Corps International's World Championship broadcasts. In previous years, commentary about a corps' program was typically unavailable for viewers until the season had come to a close. "Now with a mid-season Webcast on the Fan Network, we can provide that insight before the season ends and fans can appreciate the corps' achievements even more," Blair added. Saturday's lineup will include a 4 p.m. opening performance by the San Antonio-based Open Class corps, Revolution, followed by 21 of DCI's 22 World Class corps that are taking part in the competition. The order of performance for the DCI Southwestern Championship will be determined Friday night after the scores from the Southwestern Series events in Dallas and Houston have been tabulated. 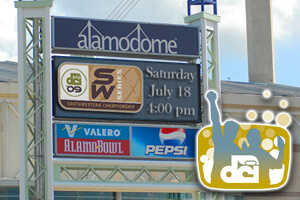 At the end of the San Antonio event, a 2009 Southwestern Champion will be crowned and caption award-winners based on averages from all of the series events will be recognized. If you are a DCI Fan Network Plus subscriber, you have access to these three different viewing experiences for Saturday's Webcast already at the best value! Fans can also access the Webcast with the pay-per-view option for $19.95. Visit the DCI Fan Network to learn more about accessing Saturday's Webcast.